Chanukah and Thanksgiving coinciding is an extremely rare alignment of the Hebrew and Gregorian calendars. 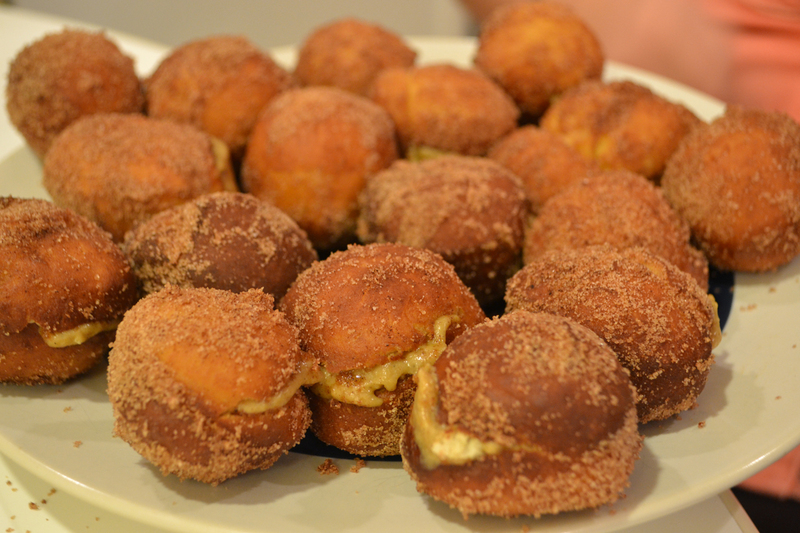 I’ve created pumpkin cream filled sufganiyot as my offering for Thanksgivukkah. In a mixer fitted with paddle attachment, beat remaining sugar with egg and egg yolk. Add sour cream, salt, vanilla extract, orange zest and yeast mixture, and mix well. Gadually beat in the flour. Mix until dough is soft, smooth and elastic, adding flour if dough seems too sticky, 3 to 5 minutes. Do not add more than an additional 3 tablespoons flour; dough will be somewhat sticky, but will firm up in refrigerator. Place in an oiled bowl, cover, and refrigerate at least 4 hours or overnight. On a floured surface, roll out dough to ½-inch thickness. Use a bcookie cutter to cut out 2-inch rounds, placing them on a parchment-lined baking sheet. Reroll scraps and cut again. Let rise in a warm place 30 minutes. Heat 3 inches of oil to 365 degrees. Fry doughnuts a few at a time until golden brown, turning once. Drain on paper towels . Let oil come back to 365 degrees between batches. While the doughnuts are still warm, roll in cinnamon sugar to coat. Fit a large pastry bag with a ound tip and spoon pumpkin pastry cream into bag. When doughnuts are cool enough to handle, use tip of bag (or pointed tip of a serrated knife) to make a hole in bottom of doughnut. Squeeze pastry cream into the doughnut, about 1/2 to a full teaspoon. Repeat with remaining doughnuts and serve immediately.